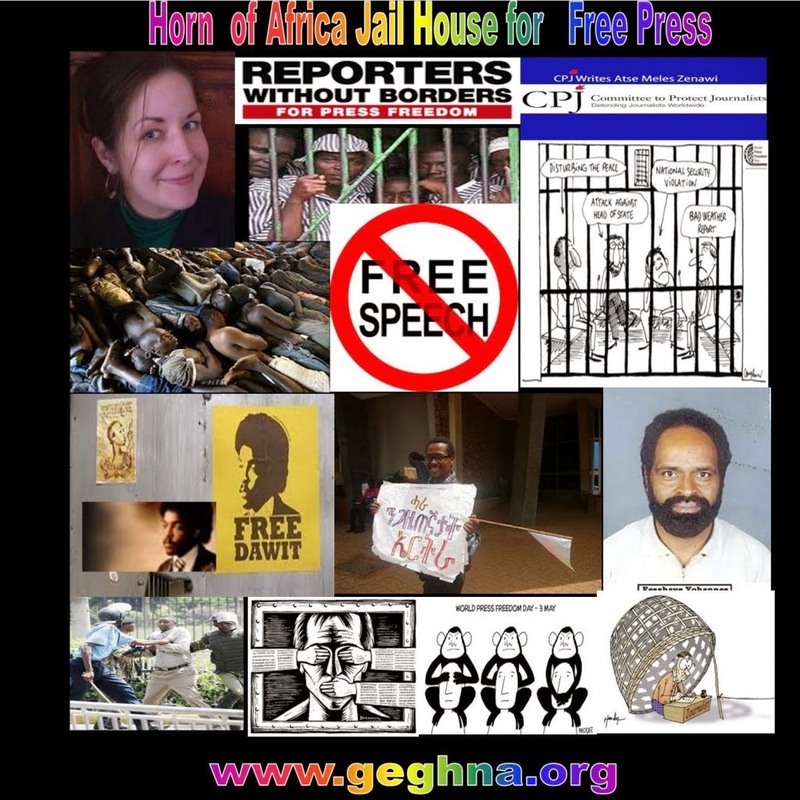 (New York) - Four Ethiopian journalists have received the prestigious Hellman/Hammett award for 2012 in recognition of their efforts to promote free expression in Ethiopia, one of the world’s most restricted media environments. Eskinder Nega Fenta, an independent journalist and blogger; Reeyot Alemu Gobebo of the disbanded weekly newspaper Feteh; Woubshet Taye Abebe of the now-closed weekly newspaper Awramba Times;and Mesfin Negash of Addis Neger Online were among a diverse group of 41 writers and journalists from 19 countries to receive the award in 2012. Eskinder, Reeyot, and Woubshet are imprisoned in Ethiopia; Mesfin fled in 2009. All four journalists were convicted in 2012 under Ethiopia’s draconian anti-terrorism law. The Hellman/Hammett grants, administered by Human Rights Watch, are awarded annually to writers and journalists around the world who have been targets of political persecution and human rights abuses. The prize is named after two American writers who were harassed during the 1950s anti-communism investigations. Lillian Hellman suffered professionally and had trouble finding work while Dashiell Hammett spent time in prison. A distinguished selection committee awards the grants to honor and support journalists whose work, activities, and lives are suppressed by repressive government action. The journalistic work and liberty of the four Ethiopian award-winners has been suppressed by the Ethiopian government in its efforts to restrict free speech and peaceful dissent, clamp down on independent media, and limit access to and use of the internet. They represent a much larger group of journalists in Ethiopia forced to self-censor, face prosecution, or flee the country, Human Rights Watch said. Eleven Ethiopian and foreign journalists have been charged and sentenced under Ethiopia’s anti-terrorism law in 2012. Critical blogs and internet pages are regularly blocked. The Ethiopian parliament passed a new telecommunications law in 2012, further controlling internet usage, just weeks after the biggest state printer, Birhanena Selam,issued a new contract for its publishers stipulating that it could censor the content of any publication it deems to violate the law. According to the Committee to Protect Journalists, the third-largest number of journalists forced to flee their countries since 1992 has been from Ethiopia, after Somalia and Iran. Like many other journalists in Ethiopia, the four award-winners have suffered greatly, both personally and professionally, in following their profession and exercising their right to free speech, Human Rights Watch said. On July 13, after nine months in detention, Eskinder Nega, a veteran Ethiopian journalist and the foremost critic from the media of the ruling Ethiopian government, was sentenced to 18 years in prison for conspiracy to commit terrorist acts, as well as participation in a terrorist organization and treason. His case is under appeal. He has been jailed numerous times. Eskinder and his wife, the fellow journalist and newspaper publisher Serkalem Fasil,were arrested, detained for more than two years, and charged with treason following the contested 2005 elections. They were acquitted of all charges in April 2007. Since his release, Eskinder has faced ongoing harassment, surveillance, and intimidation. The authorities denied him a publishing license. In February 2011 he was once again briefly detained. Despite the ongoing harassment, he refused to leave Ethiopia and continued to write and speak out until he was again imprisoned. Woubshet Tayewas the deputy editor of the Awramba Times prior to his arrest on June 19, 2011. He was convicted, along with Reeyot Alemu, on three counts of terrorism in January 2012. Woubshet alleged in court that he had been tortured during his pretrial detention, but the complaint was never investigated by the court. His arrest was not the first threat he faced as a result of his work. In 2010, prior to the general elections, an official from the government's media licensing office accused him of “intentionally inciting and misguiding the public.” Woubshet was also briefly detained following the 2005 elections. Reeyot Alemu was an English teacher and a columnist with one of the last remaining independent papers, Feteh. Reeyot was arrested on June 21, 2011, and convicted on January 19, 2012, on three counts of terrorism. In August, an appeals court reduced her sentence from 14 to 5 years, maintaining one of the terrorism charges against her. Mesfin Negash works for Addis Neger Onlinewebsite, which he established along with other colleagues after fleeing the country in 2009. Mesfin was convicted in absentia in the same trial as Eskinderunder the anti-terrorism law’s article on support for terrorism, which contains a vague prohibition on “moral support.”Mesfin was one of the editors of the now-defunct popular analyticalAddis Neger newspaper, but was forced to close the paper and go into exile in November 2009, with most of the paper’s senior staff, after the authorities threatened him.